How to make the most of the World Cup: Apps, Web sites, podcasts and more! Let’s get down to business. 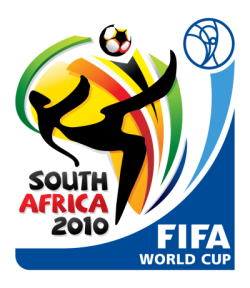 The World Cup begins tomorrow, June 11, 2010. The tournament kicks off with hosts South Africa against Mexico at 9:30am ET/6:30am PT on ESPN in the U.S. (International readers: you’ll have to consult your local listings.) Consider this post a general how-to on making the most of the tournament. Mobile Apps, helpful Web sites, podcasts, etc. Woo~! This section only covers the U.S. ESPN/ABC has the rights to the World Cup, and all of the matches will air on the ESPN cable channels and on the ABC network. The first game is South Africa v. Mexico at 9:30am ET on ESPN. It’s in HD, of course, but also in 3D if you have access to ESPN 3D. I’m not rich and I don’t have a 3D TV so whatever. All the games are spread across all of the ESPN/ABC networks, so be sure to check either your digital cable/satellite program guide or ESPN’s Web site. The big game this weekend, England v. USA, is at 1:30pm ET on ABC. Well, at least that’s when coverage starts. There’s an extraordinary number of Web sites devoted to World Cup coverage. The ones I will be checking every two seconds include The BBC (UK), The Guardian (UK), The Times (UK), Marca (Spain), AS (Spain), SPORT (Spain), El Mundo Deportivo (Spain), A Bola (Portugal), Record (Portugal), O Jogo (Portugal), La Gazzetta Dello Sport (Italy), Corriere Dello Sport (Italy), O Globo (Brazil), Clarín (Argentina), France Football (France) ESPN (USA), and Goal.com (USA). Another cool site? Zonal Marking. It discusses tactics and whatnot in incredible detail. Highly recommended for the soccer wonk in your life. Two ProTips: Try Roja Directa and Iraq Goals. If you’re stuck in the office when a big game is going on, go to either of those sites and you’ll find links to live-streams of all the games. Are these sites legal? I don’t know and I don’t care, and neither should you. 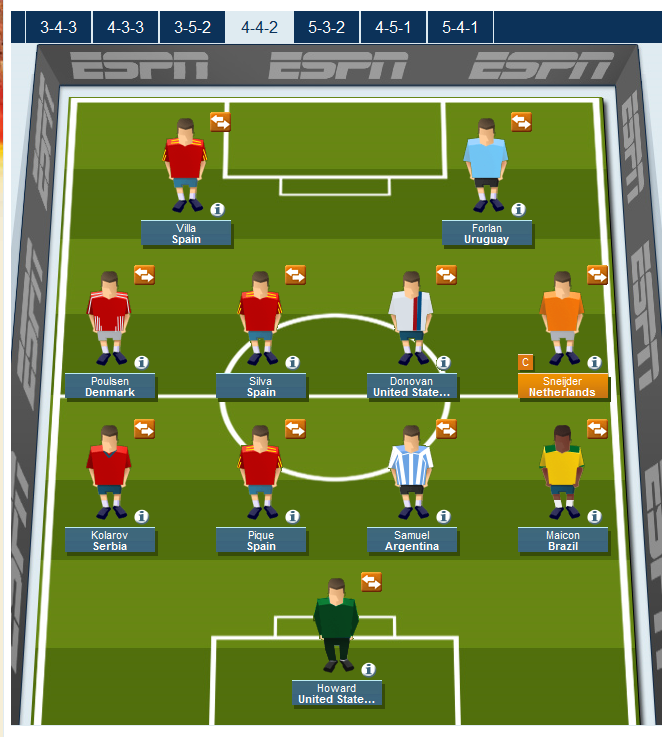 As far as “fantasy” World Cup goes, I’m using ESPN’s deal. Both the simple brackets and the full-on fantasy game. I’m basically doing them to play along with Ron and Fez on Sirius XM. I’ve never done “fantasy” sports before and I don’t plan to make it a habit. It seriously took a good 45 minutes picking my team. Just like there’s a number of Web sites out there, there’s a whole hell of a lot of Apps out there for your phone. Seeing as though I’ll be at E3 next week I will be checking my phone every 23 seconds. Goal.com’s App [iTunes link, but also available for Android]. It’s basically all of Goal.com (which I believe is the largest soccer site out there) on your phone. Live scores, post-game reports, etc. Totally free, so go crazy. This is the one I’ll be using at E3, I imagine. NYC Soccer Game Finder. This App [iTunes link] points New Yorkers in the direction of places (bars and the like) that are showing the games. It’s for the iPhone and iPod touch (though I imagine it’s a bit more practical for the iPhone, so you can walk around the city and still be able to look stuff up). And not for nothing, but Nevada Smiths is still the premiere bar in New York to watch the sport. It’ll probably be crowded so get their early if you plan on going. Also: make sure you are, in fact, 21 or older. It’s not like the old days (World Cup 2006) when I could waltz in at noon and buy Stella after Stella at the ripe old age of 19/20. The Man now cards for real, so fair warning. I only picked out two here because, you know, I don’t have all day to list 8 million Apps. Just search “world cup” on the App Store and the Android Market and you should be cool. I looked at a bunch of them are they’re all sorta the same: live scores and the like. The Guardian has a podcast, World Cup Daily, that will absolutely be worth downloading. It’s free. World Football Daily is another great podcast that will be bringing the thunder during the tournament. It’s not free, but it’s only $5 per month: just buy one less fancy drink at Starbucks this month and you’ll be all set. I am freaking out. It’s finally here! AAAHHH~! Oh, also: if you know of any other sites or whatever feel free to drop a line down below.